With your trolling motor being responsible for the propulsion and steering of your boat, it’s important that you have a reliable source of power so you don’t encounter any difficulties. In this article we will be looking at which is the best trolling motor battery, the important factors to consider when buying one, and provide a range of trolling motor battery reviews to help you decide which one is right for you. There are two main types of boat batteries that are used on marine vessels; ones that are used to start the main engine, and those that are designed specifically for use with trolling motors. The former, known as cranking batteries, are designed with thinner lead plates in their construction to give shorter, sharper bursts of power, whereas the best batteries for trolling motors are deep cycle units designed to provide more consistent power over a longer amount of time. It’s important that you don’t interchange these types of batteries, because they are intended for very different purposes and will lead to problems. This is why it matter which the best trolling motor battery is for you. All batteries work by submerging lead plates into an electrolyte solution that is made from a mixture of acid and water. The use of the battery generates heat that causes the water to evaporate, and eventually the plates will become exposed and the whole battery will need to be replaced. As we said earlier, the best batteries for trolling motors are ones that release a small amount of power over a long period of time, and are easy to recharge. This is why deep-cycle batteries are ideal. There are two types of 12 volt deep-cycle battery that are suitable for powering a trolling motor; a lead acid wet cell, and an AGM battery. Lead Acid Wet-Cells are the most common ones that are used. They are much cheaper than AGM batteries, and are designed to cope with the regular re-charging and draining that is needed. These types of batteries will typically last for about two years, but they do require maintenance to be effective for that time. You will need to occasionally top up the water, and there’s a risk of the battery spilling in turbulent conditions. AGM batteries, on the other hand, try to deal with all of the problems that are associated with lead acid wet-cells. It stands for “Absorbed Glass Mat” and comes in a completely sealed container. They last a lot longer, potentially up to four years, and don’t need to be re-charged as often. You don’t need to maintain them, like you do with acid wet-cells, but they cost significantly more than the alternatives so might be pushing the limits of your price range. There’s no doubt that they are the most convenient trolling battery you can get. ​Batteries contain acid and various nasty chemicals, so it’s vital that you take all precautions to prevent these from getting out. They can be a hazard for whoever’s on your boat, and devastating for the local environment. Lead acid Wet-Cells need occasional topping up, so involve a risk of spillage. Some models are better than others with anti-spill guards that prevent accidents in the worst of conditions. The closed design of AGM motors means that this is not a concern if you have one of them. Depending on the design of a battery, it will hold a maximum electrical charge similar to how your car will hold a certain amount of fuel. This is referred to as the amperage hour rating, and will give you a good idea of how long it will last before needing to be re-charged. The figure relates to how long your battery is able to consistently provide the amperage, with a higher number signaling the battery will run for longer. 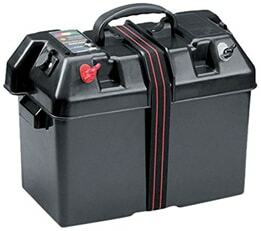 A 120 amperage battery, for example, will hold more charge than a 100 amperage battery. The deciding factor on how effective a battery is, and how big a battery you require, is the amount of power that your trolling motor draws when in use. If, for instance, your motor uses 4 amps an hour, then a 100 amperage battery will last for 25 hours. As your power usage increases the amount of time will decrease, and vice versa. In most cases, a battery that has a rating of at least 100 amperage hours will be more than enough for your trolling motor, but if you’re planning on using it for extended periods of time you may need to get something a bit larger. Your boats weight will also have an effect on how powerful a battery you need. After all, you want to be getting to your valued fishing spot in decent time so you will need one that can provide plenty of thrust to the motor when needed. Having excess capacity will also help when you are returning to shore with your massive catch. 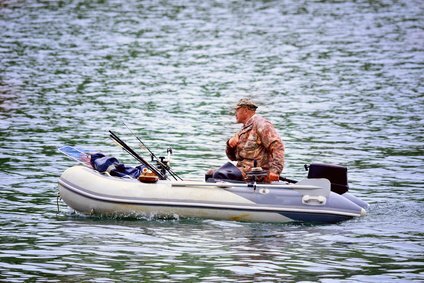 ​You might consider using a trolling motor for kayaking and the way that you use the kayak battery will have an effect on its longevity and effectiveness at storing a charge. In an ideal situation you won’t be completely draining your battery, especially if you are using a wet-cell, and it’s preferable to re-charge them with a slow trickle instead of trying to quickly do it. This will prevent the temperatures inside the battery from rising, which can start causing damage. 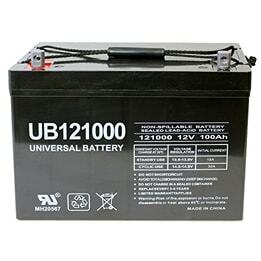 This battery from Universal Power Group is designed to be ideal for your trolling motor. It is an AGM battery so requires no maintenance, and this enclosed design also means that you won’t need to worry about spillages. It can be placed anywhere on your boat that you want, and won’t be damaged by shocks or vibrations. With a rating of 100 Amperage hours there will be plenty of power with each charge to keep your trolling motor going for a long time, and all of this from a battery that is compact in its design, and only weighs 63.93 pounds. As a deep cycle battery you’ll get about 500 full discharges before needing to think about replacing it, and it’s not just your trolling motor that it can be used with; if needed it will also work with golf carts, power sports, emergency lighting and a number of other uses. As an AGM battery, this product should last for between three and four years, with the manufacturers offering a 1-year warranty to cover you in case anything proves to be faulty. This power center from MinnKota is designed to provide all of your electrical needs on your boat. While it doesn’t include an actual battery, it provides a space for you to put one and adds a series of features that you wouldn’t get with a battery on its own. To start with, it avoids the problem of not having a battery compartment on your boat, because the battery will fit inside this box and be fully contained within it. It works with 24 and 27 size batteries, and has easy access external battery terminals that make it easy to connect your trolling motor and leads without having to open it. 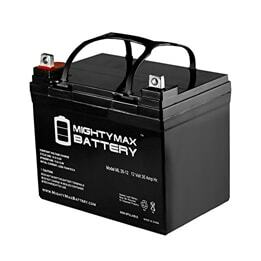 If your power requirements aren’t too high, then this battery from Mighty Max could be a good choice for you because it is nowhere near as expensive as the higher capacity versions. It is rated as 35 Amperage Hours, which is on the light side, so before you consider purchasing this battery you must be sure that it will satisfy your needs. As an AGM battery it doesn’t require topping up with water or any other maintenance, and it can be safely put wherever you need without the risk of spillages. It is very light, at 23.15 pounds, so is ideal as a portable battery, and with dimensions of 7.68x5.16x7.13 inches it won’t take up much space either. As a battery for smaller boats and shorter trips, you really can’t go wrong with this one. It’s reliable and comes with the screws you need to attach it to your motor. It doesn’t include a wire harness or mounting accessories, though, so if you need them you will need to purchase them separately. If your boat doesn’t have anywhere to store the battery, or you simply want more functionality added to the one you have, then this power center could be a good choice. 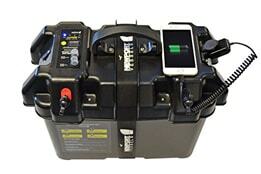 It doesn’t include a battery, but is compatible with most 12V models that will fit inside it. Once installed, you won’t have to remove the battery until it’s time to recharge it, with the power center providing all the connectors externally that you need to attach the power to your trolling motor. As well as this, the center offers a series of other useful features such as a USB charging port and a 12V accessory port. The non-slip rubber feet are a good addition that ensures it stays in place, but the best safety add-on’s are the dual integrated circuit breakers. There is a 10 Amp one for the accessories ports, and a 60-amp one for the connection with the trolling motor, and these will prevent anything being damaged from unexpected surges. The battery meter is a really useful feature for when you are on the water, because you’ll always know how much charge you have left in the battery. 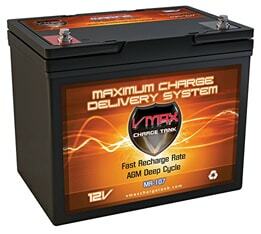 This battery from Vmaxtanks is an AGM design so will not need to be topped up with water or maintained at all. It can be mounted in whatever position you want, and because of its enclosed design you will not need to worry about it spilling. It is rated to provide 85 Amperage Hours, which will be plenty to power a standard trolling motor for up to 10 hours. These batteries have an incredibly long life span, with the manufacturers suggesting that they will last for up to ten years. It is, of course, quite a large and heavy device- weighing 58 pounds and measuring 10.2x6.6x8.3 inches, but this is what you would expect from a battery that is as resilient and stores the amount of power that this one does. This product is very easy to re-charge, with the company recommending a particular charger to do this with (that isn’t included), but it will work with most charging units. Trolling motors need a consistent power source to operate efficiently, and there are a number of ways to provide this. The best trolling motor battery will be self-contained so that no maintenance is required, and hold plenty of charge to keep your boat moving for as long as you need.